The Informed Market Expansion Solution developed by SocialCops helps businesses expand into new geographic markets in a targeted, effective and informed way using data intelligence. 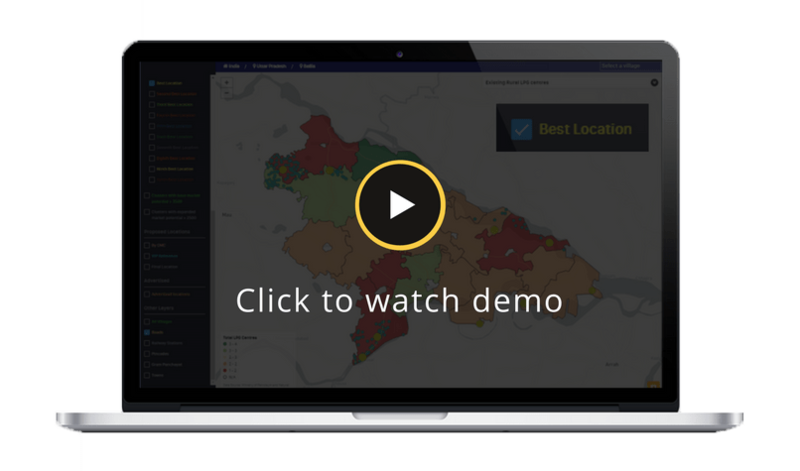 Calculate market potential and location feasibility for any geographic area, prioritize areas with the highest market potential and find the best locations to open a new store, all in real time. Watch the video demo to learn more about this solution. In case you cannot access the video on this browser, please click here. Enter your details to watch the demo. This solution brings together internal company data from siloed MIS systems, databases and reports — such as the store locations, their sales performance and consumer purchase patterns — and maps it across different blocks, cities and states using geospatial data. This company data is layered with relevant demographic and socio-economic data, like land availability, population, affluence, transport connectivity, infrastructure, and more. This makes it possible to calculate the market potential and location feasibility of every geographic cluster. With this solution, businesses can view a data-driven picture of any geographic market they are looking to expand into. View your existing stores and business operations network on a map. Analyze different geographies and locations by their market potential. Identify areas with the highest business potential for growth within a geography. Discover all the possible locations within an area to open a new store. Choose the best location by comparing nearby points of interest, transportation and other infrastructure and facilities. Learn more about the role we played in helping India's three biggest oil companies find the best locations to open 10,000 new distribution centres.